Today, I want to tell you about the other two pieces of the matte jersey collection I received from Magellan’s last week. Aside from the wrap dress, I also received the Essential Matte Jersey Twist Tank and the Matte Jersey Pants (petite size). As I said before, Magellan’s is excellent at designing clothing for the normal traveler, because they know that people want to look polished while also being comfortable, something many other clothing companies don’t quite build into their designs. Magellan’s clothing can work for all ages, sizes and for leisure and business travelers. If you don’t want to be mistaken for a tourist, then you definitely want to go browse their site. You know, after you read my review! This is another piece that I think would be great if it came in a petite size. If you like a top to be a little longer, you will love this, because it has a bit of a tunic length (unless you’re tall, in which case it will fall right around your hips). Of course, being a shorty, I also have the disadvantage of normal length tops being a little long on me. This one hit just below my bum, which is a preferred style for many now, as skinny jeans and leggings are so popular. I travel with lightweight skinnies, so this top would be a perfect addition to those, as well as with the Essential Matte Jersey Pant. Okay, on to what I love about this top: The style is lovely and the twist is flattering on all body types. The twist in the front gives the rest of the top a draping effect that will hide a tummy pooch (if you got one and want to hide it) or just give you a bit of room after eating all that yummy food at lunch and dinner. The top fits well in the bust (you don’t feel as if you might “fall out”) and is free-flowing around the middle, so you’re never self-conscious and always comfortable. I paired it with both the EMJ pant and also another pant to show how you can make it casual or a little more hip. While this one is sleeveless, you have the option of purchasing the same top, but with sleeves, though I think putting a little cover up on it would be preferable in the summertime. It’s certainly a piece that will transition for whatever you have planned, be it dinner and movie or climbing the many steps of St. Paul’s Cathedral. The fabric is wrinkle-resistant and moisture-wicking, which means it’ll look great, even if you find it balled up in the corner of your carry-on bag. It has the benefit of a hidden zipper pocket that you can hide money or your debit card in while out and about, too. I am a fan of pockets. These are probably one of the best travel pants you will buy if you aren’t planning on hiking trails and climbing rocks. For the normal traveler – those that like to go to museums, check out historical monuments and go shoe shopping – these are fantastic and go with almost everything. I had fun pairing them with items that I would take with me to go to dinner, run around town and just generally be comfortable while looking good. These have two zipper pockets, which are pretty hidden and great for small bills and coins you may need on a daily basis. They don’t poke out either, which is a big concern I normally have for pockets in pants that are flowy. The pocket fits the shape of your body and the pant, so it lies flat. I got these pants in petite size, so if you are taller, I would suggest the regular length. They hit me at the right spot I like in travel pants, since I could wear flats or heels and not worry about tripping on the hems either way. I would not suggest these pants for colder weather, as they are fairly lightweight and won’t keep the cold out, unless you want to pair them with a base-layer for warmth. Also, they are not attractive if you are a shirt tucker, since the top of the pant is stretchy and may not be tight enough to your body to look natural. I think most people who are looking to buy a pull-on pant aren’t really looking to show off their tummy anyway, so I wouldn’t let that sway your decision. They are a very flattering piece for those that enjoy longer tops or tops that are not more body-hugging and hit about mid-hip. 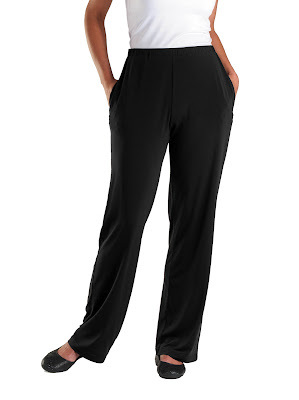 These are sure to become one of your favorite go-to travel pants, as they are attractive while not being clingy and can be worn for pretty much anything you’ll be doing, because they can be dressed up or down as well. Don't forget that you can get 5% cash back when using Ebates to make your purchase at Magellan's. Disclaimer: I was provided with the Essential Matte Jersey Twist Tank and Pant for the purposes of this review. All opinions are 100% my own.